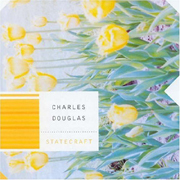 Proudly featuring Joey Santiago of The Pixies, Charles Douglas' Statescraft doesn't need the namesake to sell it, though it does help. Douglas is a good songwriter on his own, as Statecraft will attest to. Sixteen tracks of happy, bouncy pop songs fuzzed out with guitars and driven by a rock appetite, you can tell Douglas knows his way around a song. From the sunshine pop of "I Don't Care" to the laid-back pop of "Revelation in Chapel Hill", or the back porch romp of "Take It Off", Douglas creates pop-rock songs that make you feel good. I'll give it a B.